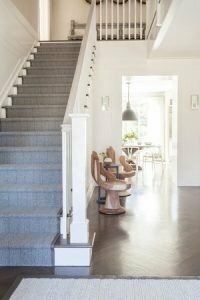 We have all heard carpet brings warmth into the home, but homeowners are straying from the plush material and sticking to solid surface flooring throughout their home. What better place to install a welcoming, warm material than the stairwell? 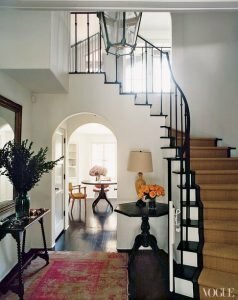 As a homeowner with a 50 pound dog and heavy stair traffic, I’m on the search for a textile that will endure the test of time, provide foot traction and create a cohesive design in my transitional entryway. Now let’s determine what you are looking for in a stair runner! Once you have decided a budget for your staircase runner, consider the material that would best suite your household. Although many shoppers tend to gravitate toward natural fibers, a synthetic material such as nylon or olefin will provide protection, comfort, style and cleaning ease. Do you have some wiggle room in your budget? Tough textiles such as tight woven wools and micro-loop wool are even more durable materials suitable for high foot traffic. If you had to peg a style for your home, would it be modern? Traditional? How about somewhere in between – maybe Transitional? The good news is, there’s a pattern and color for everyone! 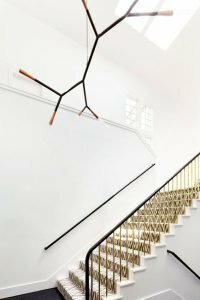 Take a look at your staircase walls and surroundings now or your future design for the space. Determine your focal point and move from there. 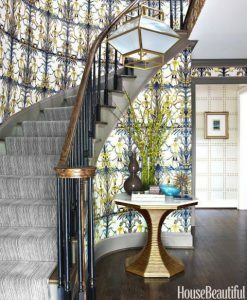 For my entry, the curved stair wall covered in Dorothy Draper’s Brazillance wallpaper is what catches my guests’ attention. Therefore, I would likely choose a solid, tight woven wool to compliment the overall glam scheme. Maybe your walls are solid and this is THE ONE place you can show your stylish interior preference – consider a subtle pattern (also hides wear and tear). Of course, with any design, there are accessories to consider! Consider binding or surging both sides of the stair runner to help with fraying edges over time all while adding a little extra style, pattern, or color. Rods (often metal) installed at the tread and riser joint will add more traditional aesthesis but also reinforce the installation. Even a common furniture feature, nail heads, can be installed on the sides of a stair runner! Have I sparked your interest in a stair runner? Be sure to visit ACo and let one of their experienced designers help lead you to a final decision! Visit their website at liveaco.com or call 317.575.9540 to set up an appointment!